Mega Villas by Damac Properties in an International Golf community. A package of joyful villas surrounded by a Water Park. It is a brand new villa development facing the family-friendly the Trump World Golf Club Dubai. These Mega Villas creates a friendly environment for its buyers with giving options of 5 BR homes. 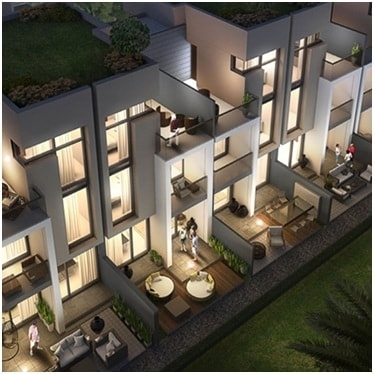 Each of the 5 bedroom villas in the community are spread across three floors and surrounded by lush open green spaces. The Price of the villas is starting from 1,450,000 AED with the completion date of 2021. Mega Villas at Akoya Oxygen is a residential villa for sale. Akoya Mega is a vibrant collection of 5 Bedrooms Villas with an area of 2453 Sq.ft and 2493 Sq.ft. The Villas have ample room space for every family member.In this community each Villas are spread across three floors.The ground floor features an open layout with a kitchen, living room & dining room. The other two bedrooms on the second floor have an access to large terraces which allows beautiful views of the community. Damac Properties is a luxury real estate developer since its establishment in 2002.The company is famous for providing the best residences in Dubai. The company has expanded and has become one of the successful developers in the Middle East. DAMAC has finished 9,318 units and has upcoming 25,362 units planning across the Middle East region. * Mall of Emirates - 30 minutes away. * Dubai Marina - 36 minutes away. * Downtown Dubai - 25 minutes away. * Dubai International Airport - 35 minutes away. * JBR Beach is at the distance of 40mins from the location. The complete address of Akoya Mega Villa is - Akoya Community at Trump World International Golf Club, Dubai, UAE. The project offers all kind of amenities like Garden Area,Mosque, Nursery, Gym, School, Coffee Shops, Parking, Restaurant, Park, Basketball court, Spa Section, Maid Service, Yoga Rooms, Retail Store, BBQ facilities, Tennis court, Pool, Gym, Security, Maintenance Staff, Organic Fresh Market, Concierge Service, Schools and Nurseries Facilities etc.